People often remark about the sharply unique feel of The Hun School culture. This is a special place. And the people who live here are the life of that legacy. As a boarding student at The Hun School, you join a community of students and teachers who are focused on living our shared values: the School’s core principles of trust, respect, integrity, kindness, commitment, and academic excellence. Resident faculty and student leaders foster a sense of structure, community, and common purpose. The entire community comes together for indoor soccer, international student dinners, and open mic nights. Resident faculty take the time to get to know you, they invite you into their families and lives. They serve as tutors, mentors, coaches, and dorm parents. 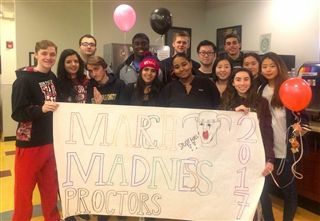 Proctors are student leaders in the Resident Life community. They are invaluable student resources in campus-life. They help new students adjust to life away from home and act as liaisons between students and faculty in the dormitories. University of Arts - M.F.A. University of Kansas - B.F.A. Florida Institute of Technology - B.S. University of Southern Maine - M.S. Trenton State College - M.Ed. University of North Carolina at Chapel Hill - M.F.A. University of Rochester - M.S. University of Massachusetts at Amherst - Ed.M.